Book Reading challenge a way to beat dementia? I am not joking at all.If you knew what else I have going on, a book reading challenge is scary difficult.The reading part may turn out to be easy.The part of it, that is proof of my reading expeditions are going to take me far beyond my comfort zone. There lies the sweet spot. According to research sudoku, crossword puzzles, brain games are only linear brain exercises.They don’t help in firing up and exciting your brain globally. A book reading challenge is just what I needed.I like challenges and goals and all those fun stuff. I work best when I have a plan. 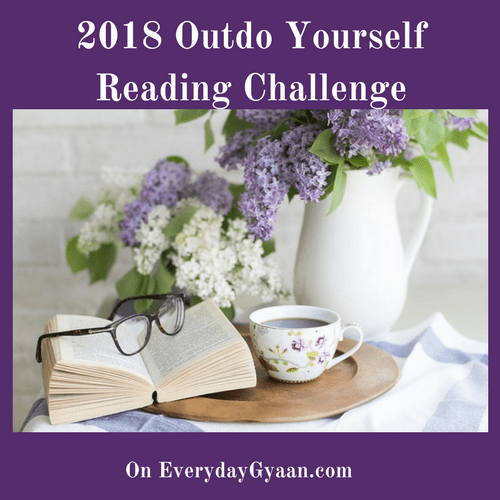 Corrine at everydaygyaan (lovely name of the blog )just started a year-long book reading challenge she has included fun levels which you can amp up but not markdown. Print books, ebooks, audiobooks everything included. I am a voracious reader and while I read all genres nowadays I am hooked on nonfiction self-help books.But I do catch up on reading all my favorite mysteries, dystopian and Bengali comfort reads. You can do it even without a blog.That’s fantastic right? Your Goodreads account is allowed. Reading helps beat those cobwebs growing all over your brain cells. It challenges you to do more and exercise your brain.It’s great for mental health. If you are a writer in any form the best way to learn to write better is to read a lot. While a public declaration of numbers can be tricky. I decided to take up Corrine’s challenge of 150 books this year. All genres and all kinds. Why did I decide to take up this book reading challenge as a way of exercising my brain? Fighting dementia is not a one-off event. While a brain-friendly diet is important.So is brain exercise. The brain loves having fun.But not any kind.The complex challenges which make you start scratching your head, that’s the kind you need to start improving your cognitive reserve. A healthy brain loves challenges that help you grow and use many parts of your brain at the same time. The hardships, love, trauma, the excitement you go through in your life all help you prevent. I will not only be reading the books, I plan to write a review for some if not all.The location for reviews may be Amazon, Goodreads, on my blog, vlog or my podcast. Now while reading my favorite books and authors are easy.Trying to mix different genres is not a cakewalk.But there lies the fun. More complex the challenge, the more difficult it gets, the better it is for my brain.The easier things get, the less exercise your brain gets. What I do know is the quickest way to grow old is to stop learning.Readinglearningg and applications help keep us feeling excited and our brain happy. Get ready for a roller coaster ride full of books you always wanted to read .I will be updating my list of books I am reading in this post here. You will also find Book reviews on my blog. 1)Have just finished Roller Coaster in Tehran and its review is on Amazon. 2)Did my first Vlog of the Book: The 365 days by Nikhil Ramteke. Want me to review your book?Read my book review policy. To read more and write more are my goals for this year too. Thanks for spreading the awareness about benefits of reading. i love reading and yes I agree it certainly keeps your brain active. Thanks for sharing with us at #BloggersPitStop. Happy reading! Loved the challenge you took. Also, the fact that, to be a good writer, you need to be a good reader. I am also planning to read more frequently this year. Book reading actually subsides Dementia. I never know that. I too agree to write a good book you have to be avid reader. Awesome Amrita. Congratulations for accepting not so very easy challenge. I am sure this book reading journey will be something you must be looking forward to everyday.. liked the short vlog. Best of luck!! Your posts are so valuable to many who almost know nothing about such conditions and how to deal with it. You never cease to amaze me. Thanks Rohini for the appreciation. amazing as always the bok reading is a great healer. Didn’t know about cognitive reserves. Building that will definitely help. This is a superb post, Amrita! Yes Sreedeep .you can start building it anytime!So the power is in your hand. 150 😱😱 all the best doc…I hope I reach there some day…You are truly an inspiration ..Great example of multi tasking multi talented person.. Challenging post. Well done on your first vlog. I haven’t tried that yet. I’m going to link up with Corrine’s chalenge too. Thank you, Zainab .I am very glad you liked it. Found the post interesting, informative & useful. Thank you.